IELTS Pie Chart lesson and model answer. IELTS Pie Charts, Writing task 1. In this lesson, we will look at. 5. Example Pie Chart and Model answer. With IELTS Pie Charts you have to compare and contrast the information. Pick out the key features of the graph or chart and write about those. Take a look at an example task below. Static data means that the chart shows one period of time. Dynamic data shows two or more periods of time. It also shows how trends change over a period of time. Different language will be used for static charts and dynamic charts. Always make sure that you first analyse the chart or graph to see if it is one time period, or the data is changing over time. If you use trend language for a static chart you will lose marks for grammar. Note: The task in this lesson is for example purposes only and not an official task from Cambridge. Always use authentic Cambridge IELTS material when practicing. 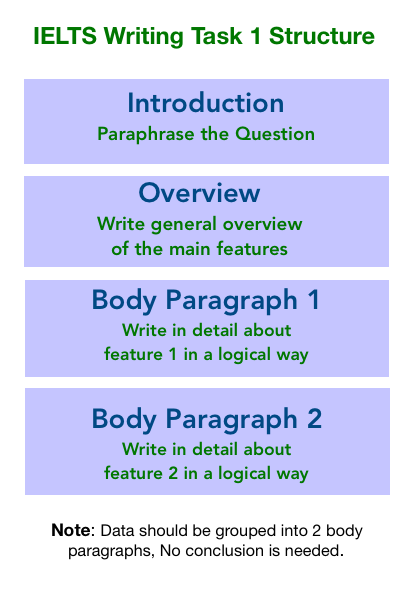 IELTS Writing task 1 academic has the same structure for all the tasks. This is different for Writing task 2 which has various essay structures. You must only write facts and compare data in task 1, no opinion is given and no conclusion is needed. Have a look at the structure below. Remember to compare and contrast when writing about pie charts and pick out the key features of the charts. The red words are paraphrased and I have added the 5 types of sources of fuel. I cannot change the words ‘pie charts’ or ‘sources of fuel‘ or ‘France 1990, 2010’ this information stays the same and doesn’t get paraphrased. natural gas production declined sharply. oil and coal also saw declines. hydropower showed a slight decrease. Overall, the use of nuclear power for generating electricity in France increased considerably, however, the use of natural gas declined sharply over the two decades. In addition, oil and coal saw declines and hydropower showed a slight decrease in consumption. In the overview I have not mentioned dates or percentages, the overview is just to introduce and summarise the main features of the pie charts. I will go into more detail in the body paragraphs. I have also used phrases like ‘however’ and ‘In addition’ . For time phrases I used ‘over the two decades’. Now I will go into detail about the changes and comparisons in the two pie charts quoting percentages. Nuclear power as a source of energy stood at 17% in 1990, however, it showed a marked increase by 2010 comprising 67% of electricity production in France. In contrast, natural gas saw a big drop in supply from 28% in 1990 to only 4% in 2010, a drop of nearly a quarter in a twenty year period. Hydropower was the least popular form of energy in 1990 and 2010. Similarly, oil and coal saw declines. Oil accounted for just under a quarter of electricity production in 1990, but by 2010 this dropped to 13%. Similarly, coal stood at 13% as a source of fuel for electricity, compared to 28% in 1990. It is clear that nuclear power became the most relied on form of energy for producing electricity by 2010. Note: The report doesn’t have to be this long, aim for around 160 to 190 words for writing task 1, minimum word count is 150 words and you only have 20 minutes to do this. In the two paragraphs, I have gone into detail about percentages and time phrases. The first paragraph shows the contrast between nuclear and natural gas consumption. I also showed comparisons with other types of energy. I end with an overall statement about nuclear energy which showed the biggest change in the pie charts. Tip: another good way structure this is to write about the first pie chart in more detail in body paragraph 1 and write about the second pie chart in detail in body paragraph 2, you can also make comparisons in the 2nd paragraph. It is a good idea in writing task 1 academic to logically organise the information, so you can write about pie chart 1 (1990) in main body one and pie chart 2(2010) in main body two. In nearly all charts or graphs in task 1 there are 3 trends: up, down, stay stable. It’s quite straightforward and doesn’t need to be complicated. Here is another way to structure the main body paragraphs. In 1990, Nuclear power as a source of energy stood at 17% of electricity production in France. Natural gas and coal both accounted for 28%. Oil was not far behind, standing at just over a fifth of energy production. However, hydropower indicated a small proportion of energy use in 1990. In contrast, oil and coal saw declines by 2010. They both followed the same pattern and dropped to 13% as a source of fuel for electricity. Most strikingly, nuclear power became the most relied on form of energy, comprising 67% of electricity production, a jump of two quarters in two decades. I have used the above example in the model answer below. 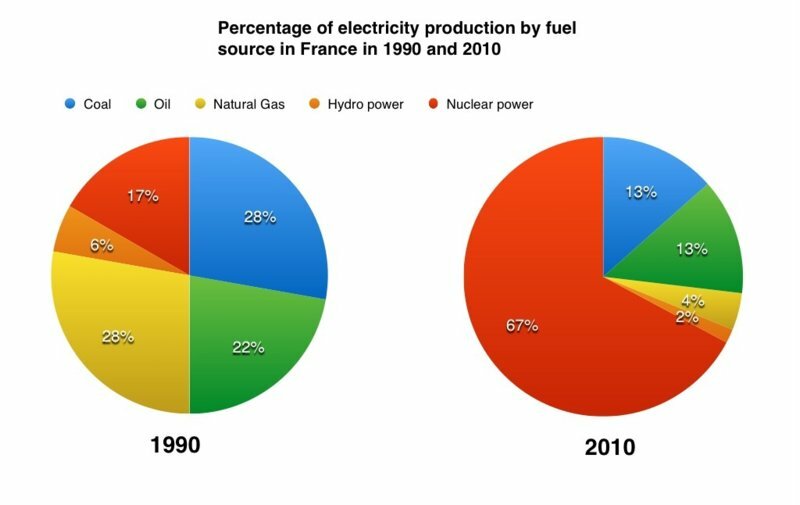 The pie charts compare the amount of electricity created from five different sources of fuel in France in 1990 and 2010. These were oil, coal, natural gas, hydropower and nuclear power.